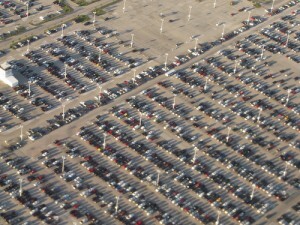 There are approximately 250 million registered vehicles (2010) in the United States. When these vehicles are not in use, which accounts for more than 90 percent of their time, they must be parked. Because of this, the off-street parking space available is ubiquitous; its footprint is vast in scale. 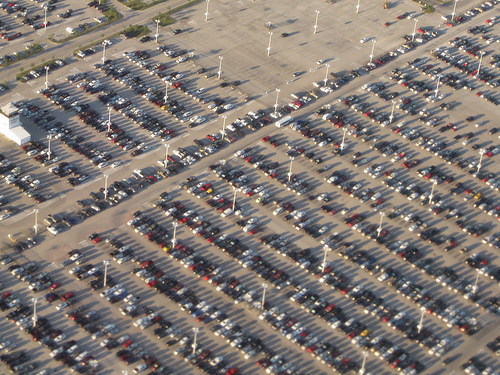 As MIT Professor of Landscape Architecture and Planning Eran Ben-Joseph recently noted, in some U.S. cities, parking lots cover more than a third of the land area, becoming the single most salient landscape feature of our built environment. This ubiquity is further compounded because cities require parking everywhere, yet ironically its absence is noticed most. The ubiquity of parking is not accidental. Parking matters. It plays an important role in the success of cities, communities, and places as well as the development of mixed-use projects and sustainable transportation. Parking supply and pricing often have a direct impact on the ability to create compact, healthy communities. Too much parking at residential properties correlates with more automobile ownership, more vehicle miles traveled, more congestion, more carbon emissions, and higher housing costs. It also results in lost development opportunity because excess parking area could have been used instead for residential or commercial development or public realm uses such as parks and plazas. Parking also has both direct and indirect environmental consequences. Direct environmental impacts include excessive land consumption, increased stormwater flows, degraded water quality, and exacerbated heat island effects. Additionally, parking structures themselves use substantial amounts of natural resources and energy to construct and require on-going maintenance to operate. In many cases parking structures are seen as unsightly when they are not internalized in mixed-use buildings or wrapped by liner buildings. Parking also indirectly affects the environment because it influences how and where people choose to travel. Where free and ample parking is provided, people make the rational choice to drive almost everywhere — and these areas register more vehicle miles of travel per capita with resulting increases in greenhouse gases and other pollutants. Striking a balance between parking supply and development is a crucial challenge in developing the character of transit-oriented development (TOD). Residents in TOD projects are twice as likely not to own a car as other US households. They’re also two to five times more likely to commute by transit than others in the region. On the other hand, residents will need access to cars even if not on a daily basis and commercial establishments require some amount of parking to service their non-walking clientele. In many cases, developers will be unable to secure financing unless parking is provided. Unfortunately, many communities have simply applied conventional parking ratios to TOD projects. Because such standards have a suburban bias and are based largely on low-density single land uses they limit the expected community benefits of TOD, and possibly, lead to project failure. A new deal on parking—less of it; shared wherever possible; energy efficient and designed properly. Right sizing parking for TOD necessitates a multipronged approach to understanding the existing and projected parking utilization and available supply in and around a TOD project area as well as the projected demand for new parking once the project is completed. Conducting a diagnostic parking study that is comprehensive and aligned with mobility choices is essential to this effort. Once the facts about demand, price, utilization, built form/development pattern, and household characteristics are understood, then appropriate strategies can be employed. Key elements include understanding differences among markets, unbundling or separating the full cost of parking from the associated use, and reducing (or eliminating) minimum parking requirements for certain land uses or certain areas. Understanding the parking uses by market and type then make it possible to look for opportunities for implementation of a wide range of measures from new technology (e.g. smart parking), to specific policies and physical design modification to consolidate and locate parking more efficiently. To ensure that parking meets the needs of a TOD project, while not impacting TOD’s benefits, there are a number of strategies that municipalities can employ working in conjunction with developers to provide the appropriate amount of parking. These strategies can be grouped into several categories, including reduction; demand; design; and pricing. Each of these categories is discussed briefly below. Given the research, along with the information developed by a parking supply and demand study, municipalities should make every effort to reduce the parking requirements for TOD projects. Eliminating parking minimums and instead employing parking maximums for TOD projects will help decrease parking oversupply. Similarly, requiring shared parking where multiple developers combine parking needs into one shared parking lot or structure may also help eliminate an oversupply of parking. Reducing the need for car travel is critical to decreasing parking demand. Municipalities or developers should consider establishing car sharing programs where multiple users have access to a fleet of cars when they need them. Similarly, municipalities and transit agencies could increase incentives for using public transportation, including providing subsidized transit passes, establishing residential parking programs for adjacent neighborhoods backed by parking enforcement, and constructing bicycle parking facilities. Designing for pedestrians is an important element to right-sizing parking. This requires reducing or eliminating design elements that hamper pedestrian use such as the number and size of curb cuts. It also requires adding elements that provide for greater pedestrian safety and aesthetic appeal. These elements might include constructing pedestrian walkways separated from parking and roads, wrapping parking behind existing buildings, designing the first level of parking structures to include other uses such as stores and restaurants, and adding public amenities like art space or public plazas which incorporate green infrastructure. Pricing is another strategy that can be used to influence how and where parking is used and located within a transit station area. On-street parking can be priced to encourage availability of on-street spots for preferred populations such as short term customers. In this case, the cost of parking for 15 or 30 minutes near shops located in the transit station area might be minimal while parking prices for more than 30 minutes is set quite high. Another strategy is to price parking to reflect parking desirability, i.e. spaces closest to activity hubs and on-street are priced higher than spaces at the downtown fringe and parking garages. While increasing transit ridership, walking and biking are essential to establishing sustainable and livable communities, the car will continue as the principle mobility choice for years to come. Given this circumstance, municipalities and developers will have to provide parking for TOD projects and the surrounding area, but should do so in a way that is appropriately sized and located. Parking can be so much more! An upcoming article in the TOD Line will highlight the next generation of green parking solutions.